Get your gas cans and pitchforks ready, another Hollywood actress has said something that is causing controversy, and at least half of America isn't going to like it. Though whether or not it will get her new movie Mother! boycotted is a whole other question. While promoting the upcoming fall release, a new thriller from acclaimed director Darren Aronofsky, Oscar-winner Jennifer Lawrence decided to get quasi-political and say something she'll probably regret by the end of the day if she doesn't already. She full-on blamed Trump voters for back-to-back hurricanes Irma and Harvey. Perhaps not the best thing to do in this social climate. The statement in itself is ridiculous. Voting for any President does not make the waters rage and the ocean swell, and winds start to whip at unfathomable speeds. That's pure witchcraft. And it's a little shameful considering the mass destruction that has happened all across Houston and other parts of Texas, which is in the midst of recovering from Hurricane Harvey and the flood waters it brought. Now, we're on the eve of Hurricane Irma, which could be one of the deadliest storms ever. Jennifer Lawrence, as seen in the video below, believes that the hurricanes where brought on by Mother Nature. And are her way of showing the 'rage and wrath' at an America who voted for Donald Trump, who has his own controversial views on man-made climate change. The actress made these comments on Channel 4 in Britain, perhaps trying to show off for her European audience. In her discussion, she talked mother!, the gender pay gap and then decided it was time to bash Trump for the natural disasters sweeping the nation as though he were Dr. Evil. She went onto claim that we're living in the End of Days, especially here in the United States. No matter how you side, or what your politics are, these comments did come off as a little disrespectful on both sides. 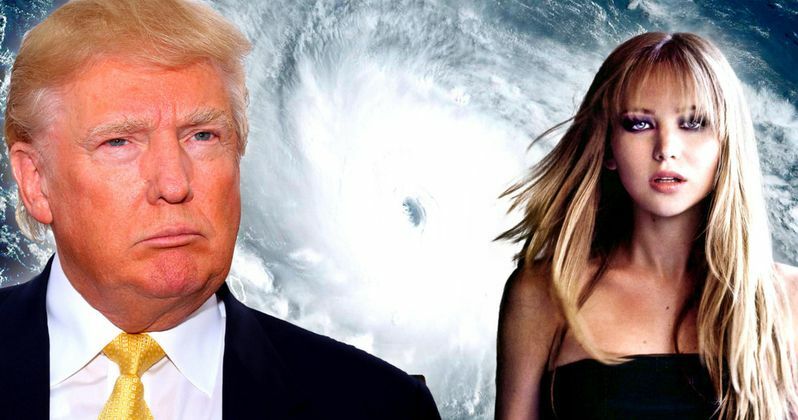 In the interview, Jennifer Lawrence not subtly blames the devastating storms on Trump winning the presidency. She goes onto say this. "You know, you're watching these hurricanes now, and it's really hard, especially while promoting this movie, not to feel Mother Nature's rage and wrath. You know, I've heard things and seen things on TV in my own country that devastate me and make me sick, and it's just really confusing. I don't find [Trump] confusing. I think I know exactly what he is." This isn't the first time the actress has accused Trump of bringing about the impending apocalypse. When Trump was first launching his presidency, she claimed his victory would ring in 'the end of the world'. You can watch the mother! actress in the interview here. In mother!, A couple's relationship is tested when uninvited guests arrive at their home, disrupting their tranquil existence. From filmmaker Darren Aronofsky (Black Swan, Requiem for a Dream), mother! stars Jennifer Lawrence, Javier Bardem, Ed Harris and Michelle Pfeiffer in this riveting psychological thriller about love, devotion and sacrifice. '.